Chandra data indicates that a young star, known as RW Aur A, has likely destroyed and consumed an infant planet. If confirmed, this would be the first time that astronomers have witnessed such an event. The star is a few million years old and is located about 450 light years from Earth. Scientists may have observed, for the first time, the destruction of a young planet or planets around a nearby star. Observations from NASA’s Chandra X-ray Observatory indicate that the parent star is now in the process of devouring the planetary debris. 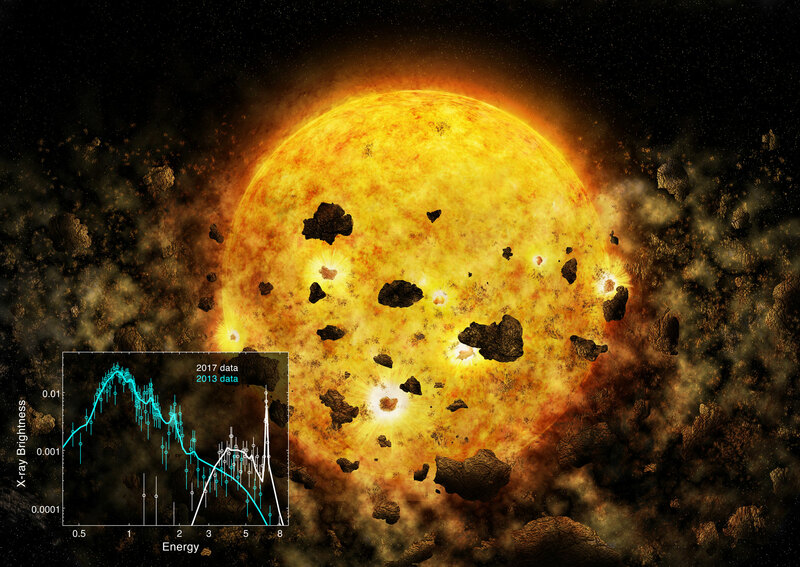 This discovery gives insight into the processes affecting the survival of infant planets. Using Chandra, a team of scientists may have uncovered what caused the star’s most recent dimming event: a collision of two infant planetary bodies, including at least one object large enough to be a planet. As the resulting planetary debris fell into the star, it would generate a thick veil of dust and gas, temporarily obscuring the star’s light. RW Aur A is located in the Taurus-Auriga Dark Clouds, which host stellar nurseries containing thousands of infant stars. Very young stars, unlike our relatively mature sun, are still surrounded by a rotating disk of gas and clumps of material ranging in size from small dust grains to pebbles, and possibly fledgling planets. These disks last for about 5 million to 10 million years. RW Aur A is estimated to be several million years old, and is still surrounded by a disk of dust and gas. This star and its binary companion star, RW Aur B, are both about the same mass as the sun. The noticeable dips in the optical brightness of RW Aur A that occurred every few decades each lasted for about a month. Then, in 2011, the behavior changed. The star dimmed again, this time for about six months. The star eventually brightened, only to fade again in mid-2014. In November 2016, the star returned to its full brightness, and then in January 2017 it dimmed again. Chandra was used to observe the star during an optically bright period in 2013, and then dim periods in 2015 and 2017, when a decrease in X-rays was also observed. Because the X-rays come from the hot outer atmosphere of the star, changes in the X-ray spectrum – the intensity of X-rays measured at different wavelengths – over these three observations were used to probe the density and composition of the absorbing material around the star. The team found that the dips in both optical and X-ray light are caused by dense gas obscuring the star’s light. The observation in 2017 showed strong emission from iron atoms, indicating that the disk contained at least 10 times more iron than in the 2013 observation during a bright period. Guenther and colleagues suggest the excess iron was created when two planetesimals, or infant planetary bodies, collided. If one or both planetary bodies are made partly of iron, their smash-up could release a large amount of iron into the star’s disk and temporarily obscure its light as the material falls into the star. A less favored explanation is that small grains or particles such as iron can become trapped in parts of a disk. If the disk’s structure changes suddenly, such as when the star’s partner star passes close by, the resulting tidal forces might release the trapped particles, creating an excess of iron that can fall into the star. The scientists hope to make more observations of the star in the future, to see whether the amount of iron surrounding it has changed – a measure that could help researchers determine the size of the iron’s source. For example, if about the same amount of iron appears in a year or two that may indicate it comes from a relatively massive source. Guenther is the lead author of a paper detailing the group’s results, which appears today in the Astronomical Journal. NASA’s Marshall Space Flight Center in Huntsville, Alabama, manages the Chandra program for NASA’s Science Mission Directorate in Washington. The Smithsonian Astrophysical Observatory in Cambridge, Massachusetts, controls Chandra’s science and flight operations. Be the first to comment on "Chandra Reveals First Evidence of Young Star RW Aur A Devouring a Planet"